FUSE BUDDY PRO TEST KIT is rated 2.0 out of 5 by 1. Rated 2 out of 5 by TOOLADDICT from LIMITED RANGE MY BIGGEST COMPLAINT IS THE PRODUCT NAME IS MISLEADING TO ITS FUNCTION. I ADMIT AM SOMEWHAT AT FAULT FOR NOT READING THE PRODUCT DISCRIPTION BEFORE PURCHASING BUT IT WAS A SPECIAL ORDER TOOL SO I RELIED ON THE REP'S DESCRIPTION. THE MATCO REP TOLD ME THIS TOOL IS USED SO THAT YOU PROTECT AGAINST BLOWN FUSES ACTING LIKE A CIRCUIT BREAKER AS THE PRODUCT NAME WOULD APPLY(FUSE BUDDY PRO). 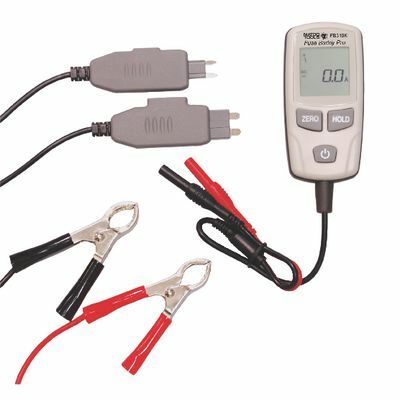 THIS TOOL DOES NOT RESTRICT CURRENT FLOW SO IF THE CIRCUIT TAKES 7.5 AMPS YOU CAN'T USE A 30 AMP FUSE WHEN YOU CHECK THE AMPERAGE. YOU HAVE TO USE A 7.5 AMP SO BASICALLY ITS SOMEWHAT HELPFUL TO FIND PARASITIC DRAWS UNDER THE AMPERAGE OF THE CIRCUIT'S RATING BUT NOT TO INDICATE A SHORT CIRCUIT. A MULTIMETER THAT CAN HANDLE 30 AMPS WOULD EASILY MAKE THIS TOOL UNNECESSARY.